The 2017 year officially ended and here we are back in the office in the new year. The same Annmarie Team that we had just a few days ago walk into work with a new air. “New Year, New You” feels right to us this year and we’re all ready to get set and go forward. One of our favorite things about working here is that we’re encouraged to grow and we support each other in every way we can. 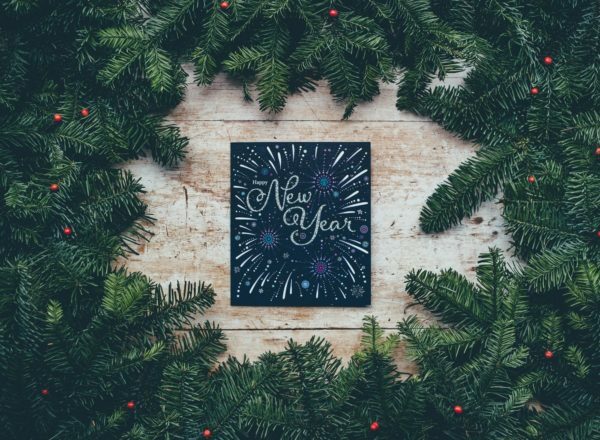 You can read it in our posts, but this one is especially filled with love and community because this week we’re talking about our 2018 goals… and you should hear the laughter—and sometimes tear-filled—conversations around the office when we do our best to support each other in our personal and professional growth goals for the year. 2017 was all lessons for me…2018 is turning all the lessons learned into action! This year's theme for me is commitment, creativity and groundedness. I am in a serious partnership that has taught me to love in new ways—I am excited to see how this year will evolve for us! I want to redefine my relationship to self-love: I tend to put a lot of energy into things around me, so I want to make sure this year that whatever I give out, that I am equally giving myself in return. I want to study and learn more about health and skin care, I want to write, I want to stay committed to clean eating habits and regular exercise, I want to travel around locally and internationally—Japan and Russia are confirmed! And I want to ground out in my home space, alter my work space, cultivate rituals, buy more plants and spend quality time with girlfriends. I want to hustle, stay humble, and remember to give more than take. 2017 was an amazing year for me; I feel like I've grown tremendously in three areas: personally, as a partner, and professionally. I want to keep adding momentum and enter 2018 purposefully and fearlessly. I am excited to take on a lot more creative projects this new year and give 110%. I want to continue to stay curious and learn about anything and everything. 2018, for me, is also going to be about being more mindful and conscious of my choices. I've chosen to set up two goals: go a full year without dairy and purchasing any new clothes (meaning I can only shop at second-hand stores if I choose to shop). In addition, I plan on applying for some long-term volunteer opportunities that specifically work with women and children who are victims of human trafficking. 2017 was a tremendous year of transition for me so my theme for 2018 is grounding—feeling closer and more connected to a smaller group of close friends, being committed and conscious in my relationship, making my house a home, and feeling more confident than ever in my role at work. That being said, I must maintain a balance in my life—and with all of this grounding work comes an opportunity to be flighty which is fueling the fire of my trip to Bali with my British soul sister this summer. I cannot wait to experience Indonesian culture and test my limits while backpacking through foreign land. I also want to plan smaller, more local trips throughout the year with my partner—I look forward to camping and hiking a ton plus being in nature as much as possible. Walking the constant path of personal and spiritual growth with perseverance and grace. In 2017 I settled into my role at ASC which is the first time in my life that my career has truly lined up with my passions, my lifestyle, my desires. My life has changed tremendously for the better since I started this role. Finding that perfect fit was my intention for a looong time, and now that this is in such a great place, I will be focusing on other intentions in 2018. My partner and I hope to grow our family this next year, and I have a feeling most of my intentions will be wrapped up around this endeavor! Also working to become the most understanding, patient and supportive partner I can be so that our new addition is welcomed into the most loving, happy family possible. Working to deepen my relationship with my own family, as it feels increasingly more important to me these days, continuing to keep my home and environment toxin-free by DIY-ing and supporting trusted brands. 2017 has been especially memorable for me because I took a bucket list trip to India and joined the ASC team! As a personal goal I try to travel to a new place I've never been every year. I would like to continue this tradition in 2018 and go to new locales. I'd also like to enhance my living space making it even more of a cozy sanctuary, and continue to grow and deepen my relationships with my partner, family, and friends. I have always had a love of dance and I would like to take more classes in the New Year as well. We have accomplished a lot at ASC in 2017 and I am so excited for the year ahead as we continue to grow and evolve! In 2018 my #1 focuses are going to be self-growth, self-reflection and being the best mother that I can be. 2017 was a whirlwind of a year and I am full of extreme highs and low lows so I am ready to head into the New Year with a new vision, new self-worth and many, many goals. I'd like to end this year a little farther (but not even nearly complete) on my path—I think things work in threes, so here's the play-by-play: 2016 was a difficult beginning on a serious solo self journey, 2017 had me settling into my own self (read: I had a lonely year but it was worth it), and 2018 has me most excited about working toward deepening my relationship—both with myself and in the incredible new relationship I’m half of. We met on an adventure, decided to travel the world together on our first real date, and already have an international trip planned for this year (Iceland in January; complete with snow-camping and northern lights chasing), so my resolutions have to include more travel! This year I will also work toward deepening my work at ASC to accomplish our goals as a team along with feeling a bit more settled in my home (building and garden projects FTW!) and playing outside even more! Do you have a New Year’s Resolution? Share with us in the comments below! Thank you for sharing your 2018 goals. I felt that I could relate to all of them! 2017 was my year to educate myself about health issues and natural ways to treat them and assist my own healing. 2018 is the year to put this knowledge into regular practice, which will involve clean eating, exercise and maintaining balance each day by meditating, reading, enjoying nature, and detoxing. May we all find success!